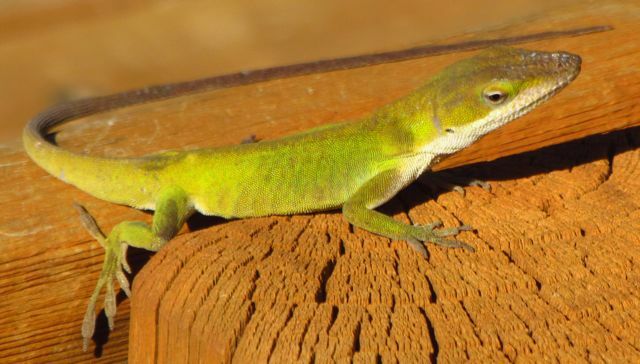 Yesterday afternoon about four, I was returning to my front door after closing my greenhouse against an impending cold night when I spotted two Green Anoles (Anolis carolinensis) — one green and one brown — moving about in one of my White Texas Sage plants near my front water feature. 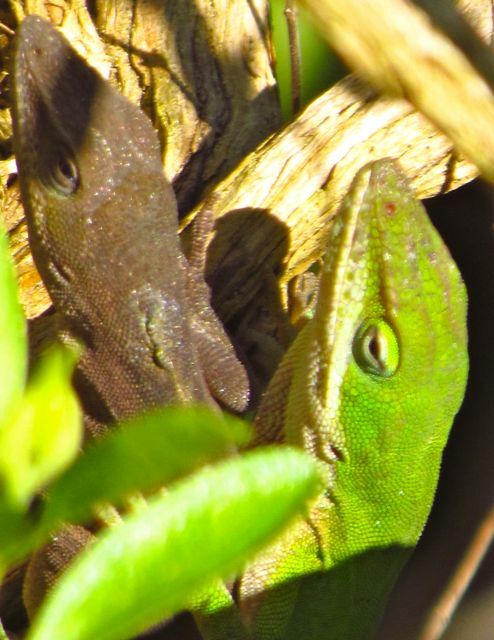 One of the lizards displayed his dewlap — that reddish throat pouch you see above — and I realized I was watching some kind of anole-anole encounter. I ran inside to grab my camera, hoping they might still be there when I returned. 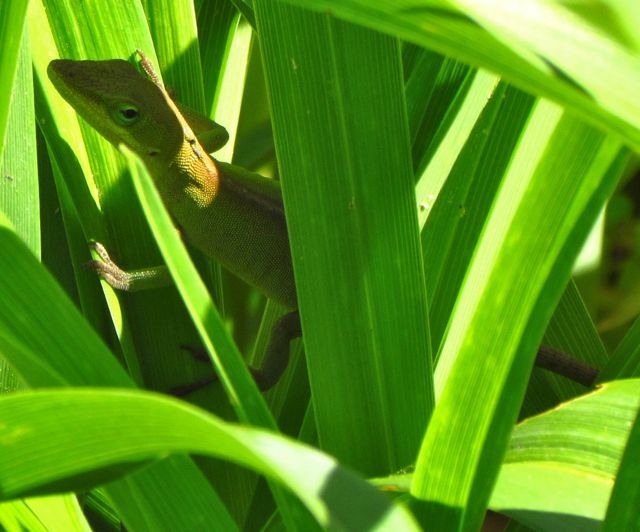 By the time I got back out, the dark brown anole had vanished into the greenery near the base of my little pond. But the bright green male in the picture above was still there, now on the low railing of my front deck beside the White Texas Sage. He obligingly posed for the shot above. I was only sitting about two feet from him. 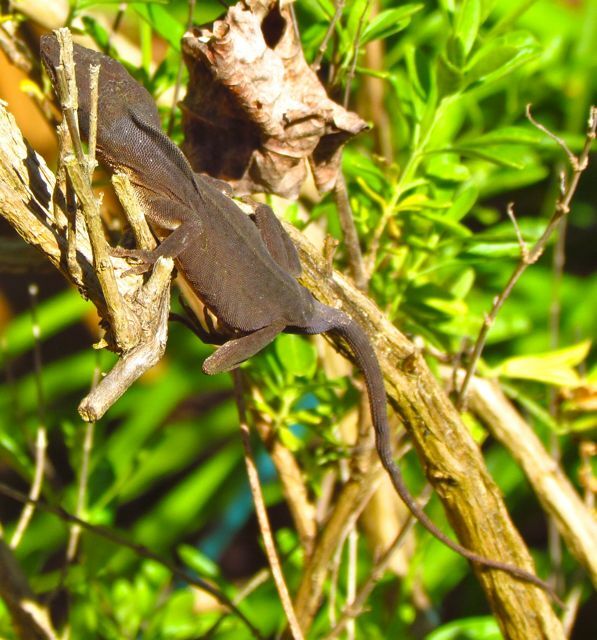 These lizards are common in my yard, but I had never seen them so docile about my presence. At first I attributed their slowness to the cool day, but as I continued to watch — for almost an hour and a half — I realized that although this fellow wasn’t thrilled about my presence, he was vastly more interested in the female lurking below him. I sat on the edge of the deck beside the White Texas Sage for the first hour, until I finally realized that the male was not happy with my proximity. I then moved to a bench just above the area about six feet away. It was only after I moved that the female relaxed enough to join the male. I watched the male change color repeatedly from bright green to greenish brown to brown to deep gray and back to green. At the time, I thought perhaps the color show — along with many throat pouch displays — were designed to impress the female. But after researching these animals a bit, I now think my proximity was stressing the poor little guy. He eventually got through to me — looking straight at me and opening his mouth wide at me — a silent roar, if you will. That’s when I finally got a clue and moved further away. The female’s color never changed, and her gender lacks the throat fans the males possess. Note the ridge along the back of his neck. He may have raised this in an attempt to look larger and scare me off. Check out those pads on his feet. 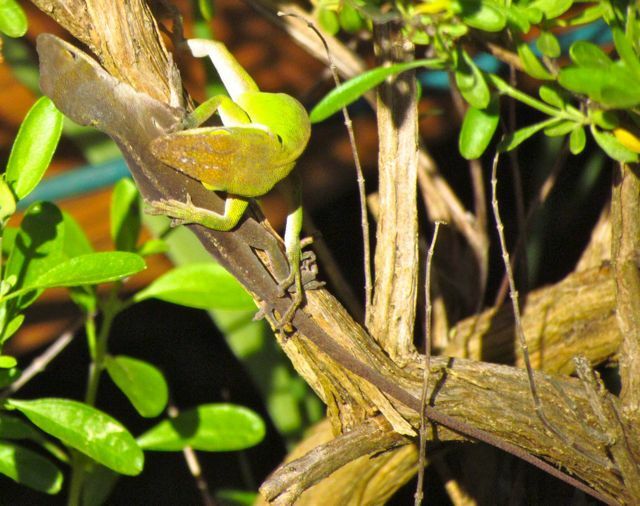 Green Anoles are mostly arboreal, although they can be found in many suburban and even urban environments at any level from ground to rooftop. Those pads allow him to stick to vertical surfaces. He jumped up abruptly and turned to look down into the greenery below. He must have spotted the female again, although I couldn’t see her no matter how hard I looked. I read that females only lay one egg at a time, and may lay one a week for a number of weeks. Dominant males keep harems of up to six females, but I saw no evidence of that in my front garden yesterday. 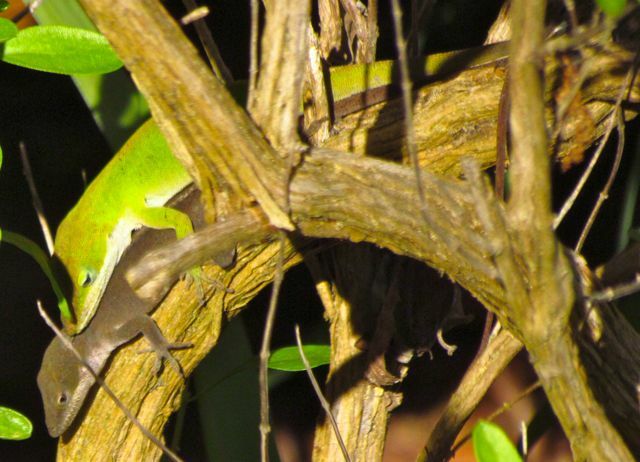 Green Anoles eat insects, spiders, and other invertebrates. When I had pet cats lounging on this front deck, I rarely saw lizards, but I had an abundance of Praying Mantises. With no cats to plague them, the Green Anoles and skinks now rule my decks, and I almost never see a Mantis in my front garden anymore. These changing population dynamics, and the encounter I was lucky enough to observe yesterday, remind me that my Piedmont garden is always first a habitat for the natives with whom I share this space. That’s why I don’t use poisons, and why my yard will always look less groomed than many others. My gardens and yard are as integrated into the native landscape as I can manage. After all, the plants and animals here are as much Piedmonters as I am. This entry was posted on April 7, 2012, 3:33 pm and is filed under Native Wildlife, piedmont gardening. You can follow any responses to this entry through RSS 2.0. You can leave a response, or trackback from your own site. Yes, I confess that I am often distracted by everything going on in my yard and gardens. My most recent rationalization to justify the time I spend out there is this blog. I’m hoping that by sharing my experiences, I am helping a few others appreciate the natural world a bit more. Happy anole watching! 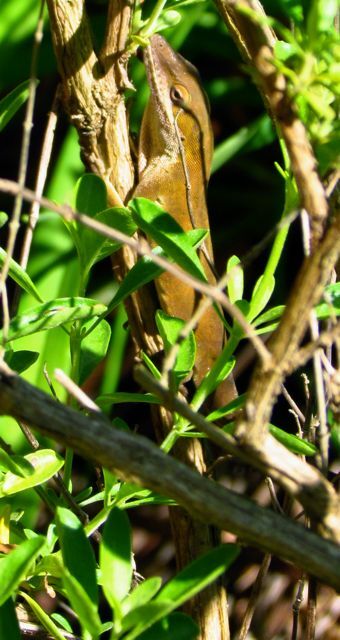 I live in piedmont N.C. and have a small voriety of lizards on an acre of property bordered by @ 150 acres, with a 1/3 acre pond 15 Feet off of the property line; mostly deep woodland. 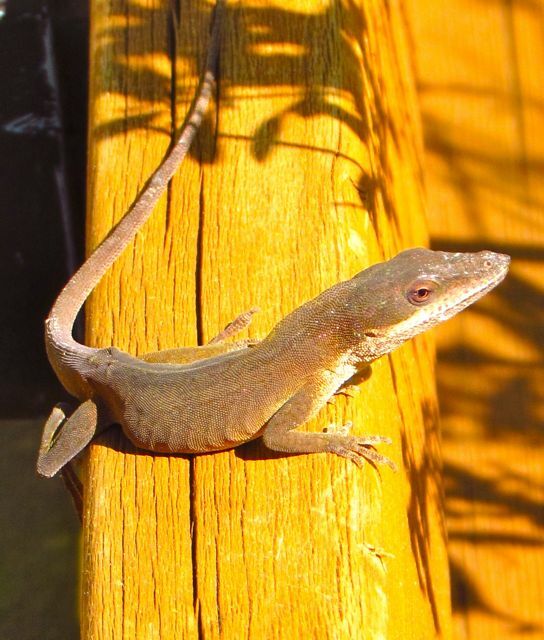 While coming up to the house from the pond I nearly squished a “couple” of anoles mating on the top of the back gate of the deck while reaching for a hand hold. Their activity stopped for just a minute,and then I saw an anole I have watched for the last few months , I’ve named him bluespot due to an injury he had gotten when he was half the size he is now; onhis right side. This was most likely from a bird bite. Frank “T.J.” jacobs Mint Hill, N.C. Your home sounds wonderful, Frank — great for wildlife-watching. 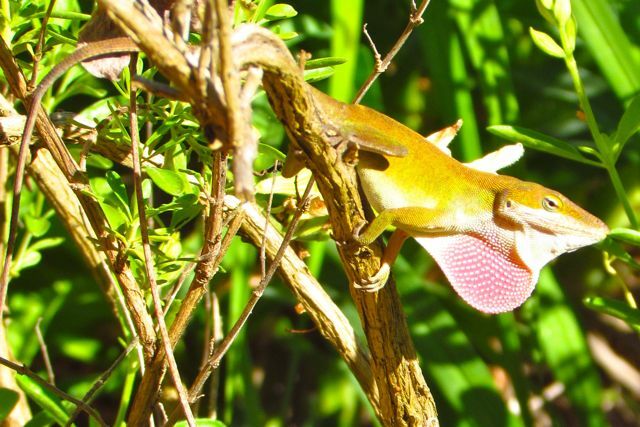 Anoles can be particularly single-minded when in the grip of their hormones, I agree. One feisty male, who often suns himself on my front deck, insists on puffing out his neck pouch every time I stop to stay hello. 🙂 They are resilient and fearless little reptiles.